According to my good friend Ranjit, a Punjabi by race, he said the mother is always the Queen in the house. I fully agreed with him. At my home, I have a special wooden plaque, en grafted with these few words... "I am the master of this house, but when my wife says No, I will also say No." So! The day Ranjit got marry to his beautiful wife 15 years ago, he advised her these few words. They are.. "The Daughter in law who knows how to tackle the Mother in law, is like holding God in you hand." Being an intelligent wedded wife, who simply understood that statement, both daughter in law & the mother built up fantastic relationship within a very short time. She almost could get whatever she wants, when all the males in the house find it difficult. For those daughters in law who could understand the above quote and are willing to apply it, you will be the most happiest woman in your husband home. Try if you can and good luck. Your son has chosen a girl as his life partner because he loves her. No matter whether it is a love marriage or an arranged marriage, as a 'loving' parent-in-law you need to give a warm welcome to your daughter-in-law in her new dwelling. She is going to miss her parents with whom she spent her childhood, adolescence and womanhood. 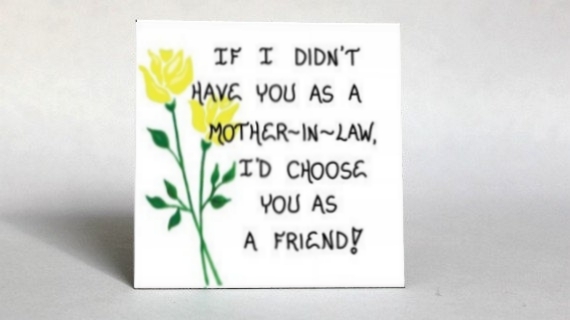 Avoid being too parently, instead be a good friend of your daughter-in-law. Befriending your daughter-in-law will help you to build a special bond with her. Robert, never gossip behind the back of your daughter-in-law. Gossiping about her to friends and relatives or even blogging will harm relations. If she discovers that you are talking not very good things behind her back, it will damage your relation with her. Your son will feel betrayed if he shares a close emotional bonding with his wife. If something is bothering you about her behaviour then it is better to talk her. She is your family. Even friend and relatives will not appreciate you talking negatively about your daughter-in-law. Remember, give respect to get respect is the formula. Will take your motherly advices. Anyway my daughter in law and us are in a beautiful relationship. She won't be so lightly influenced and further more this gentlemen who is writing for you to read here, is not just a father in law to her home. He is a friend who has fun, plenty of humour, interesting, forgiving, understanding, kind and willing to listen. You have to come over to our house to see. Please have dinner with us if you could. Otherwise thank you so much for the advices mentioned my dear. I don't entertain anonymous who darn not mentioned their names. They are robot to me without a human brain. Thank you for the support my dear. Have a joyous day, Robert! I know you will support me too. Thank you so much. Your 7th sense are not accurate this time. I did not write above anonymous comments! Dear dashing Robert, for now, She will only come by once in a while! With comments hopefully will make your day, and feel young again.